From the lay-by car park we cross over the road and go through the gate and follow the path over the bridge turning left to pass the church on our left. At the road we turn left then immediate right passing Grasmere Garden Village on our left onto Red Bank Road. We continue along the road for about ¾ of a mile past Faeryland Tea Garden until we reach a footpath sign and a sign on the wall The Wyke. We turn right uphill on the track for a short way before turning right over a tiny stone bridge to go through a gate. We keep following the path quite steeply uphill through the trees to go through a gate in the wall. We head forwards a short way bear left over a tiny stream then bear right uphill at the fork then keep bearing left then right to go round a boggy bit. We continue uphill on a faint path heading for the crags in front of us. At the crags and a cairn we turn left very steeply downhill on the distinct path. The path bears right on a narrow path before going very steeply downhill again follow the gill on our left. When we come to a wall nearly at the bottom we turn right and follow the wall down to the road. At the road we turn right then left at the church to the main road through Chapel Stile. We turn left and follow the road past the shops, toilets and the pub towards Elterwater. At the crossroads at Elterwater we turn left at the sign, Parking for Elterwater. We follow the minor road taking the short cut paths until we come to a y-junction just after crossing a cattle grid and passing High Close Youth Hostel. We cross straight over and go through the gate into the National Trust land Deerbolts Woods and follow the bridleway bearing right at the sign post for Loughrigg Terrace through the trees until we come out into the open. We now continue on Loughrigg Terrace and turn left at the seat downhill towards the weir. We then turn left and follow the Grasmere Lake shore path until we come to a lane. We turn right and follow the lane then retrace our steps back to Grasmere. This is a moderate to hard walk on minor tarmac roads, grass, stone and gravel tracks and paths. There are some steep inclines and declines and one very steep descent from the top into Chapel Stile. Elevation: approx lowest point 62.50m (205ft) approx highest point 309.60m (1015.75ft) approx ascent 410.30m (1346ft). 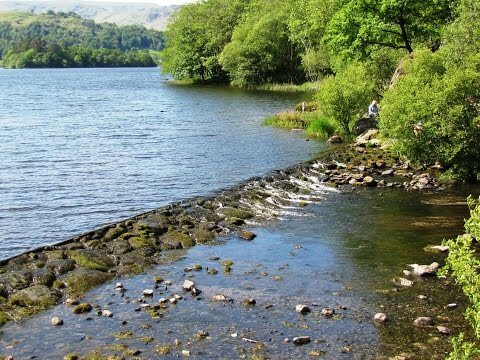 Approx 6.5 miles allow 3½ – 4 hours using OS Explorer Map OL7, The English Lakes South- eastern area. This walk is done anti-clockwise. Start point: Free lay-by car park on the A591 Grasmere. There are public toilets at Grasmere in the pay and display car park on the right just before the village and also in the village near the police station. For refreshments in Grasmere there are three pubs the Red Lion, the Wordsworth Hotel and Spar and the Grasmere Hotel plus there are many cafes and other places to eat and drink. There are also plenty of shops to browse round. There are three more pubs nearby on the A591 the Travellers Rest, the Swan Inn and the Daffodil Hotel and Spar. There are also public toilets at Chapel Stile open from Easter to October and at Elterwater near the car park and bridge. For refreshments in Chapel Stile there is Wainwright’s Inn, Brambles Cafe and Langdale Co- operative village store and at Elterwater there is the Britannia Inn and a post office and shop.